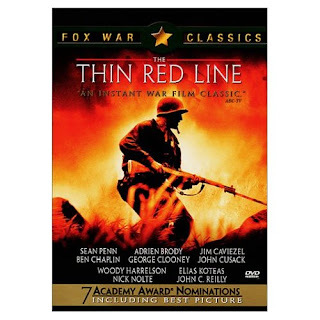 To this day, I’m still shocked when people say the dislike The Thin Red Line. Having had the misfortune of being released the same year as Steven Spielberg’s critically lauded yet (aside from the brilliant and unrelentingly brutal opening) highly formulaic Saving Private Ryan, The Thin Red Line seemed to be the antidote to the Hollywood gloss of most WWII films as it is poetic, passionate, frustrating, hypnotic, tender, breathtaking and unspeakably tragic. While it’s said in some circles that having both Spielberg’s Ryan and Malick’s Line up for the Best Picture Oscar may have helped split the vote and led to the Shakespeare in Love upset, to me, it was again proof that the Academy Awards, while important and historical, are subjective and it’s a shame that several films and performances can’t be recognized as they’re overlooked in the definitive quest of simplifying things down to a single “best” choice. In comparing the works, Janet Maslin of The New York Times wrote that “Steven Spielberg’s film was about character and Malick’s is about spirit,” although I’d argue that spirit by its very definition is embodied in a fully realized and fleshed out character and in Malick’s film (which is based on the autobiographical novel by James Jones) is filled with a wide range of characters and their unforgettable spirits. As IMDb reported Malick had longed to adapt the book by the author of From Here to Eternity since the late 1980’s yet it wasn’t until ’98 when his meandering opus about the first major offensive by America’s Army Rifle Company C (for Charlie) on the South Pacific island of Guadalcanal in 1943 was released. While fighting for an overwhelmingly long time over the “key-positioned airfled that allows control over a 1,000 mile radius,” (IMDb) we get an intimate view of both the army and inner lives of several of the soldiers including our heroic Pvt. Witt (Jim Caviezel) and Pvt. Bell (Ben Chaplin) along with countless others that are played by the likes of Adrien Brody, John Cusack, Woody Harrelson, Thomas Jane, George Clooney, Elias Koteas, Jared Leto, Tim Blake Nelson, John C. Reilly, John Travolta, Nick Stahl, Donal Logue, Nick Nolte and Sean Penn. With so many actors, it does at times become hard to tell them apart since (much like myself) the casting director must have had a thing for sensitive looking dark haired men. Viewers do at times feel a bit lost in the shuffle and may benefit from a second viewing yet contrary to critic Roger Ebert’s statement that “the actors… are making one movie, and the director is making another,” I thought they all added to Malick’s vision and their willingness to leave their egos aside for sometimes only moments of screen time owes much to the admiration for the legendary director of Days of Heaven and Badlands. The underrated Elias Koteas is especially good as Capt. Staros who fights hard to stick up for the men under his command and defy the orders of egomaniacal Lt. Col Tall (Nolte) to protect the others and save lives much to the detriment of his own career. With an average reported shot length of 7.9 seconds (IMDb) and a running time of roughly three hours, the daunting film which was nominated for seven Academy Awards alienated some with its artistic and cerebral approach but for those with the patience who appreciate a different take on a traditional war film (and one in the tradition of Deer Hunter and Apocalypse Now), you will be extremely glad you invested the time.